Roffey management duo Andy Lampard and Lee Spickett were happy with the response they got from their players against Brighton Electricity to bounce back from their cup humbling the previous week. 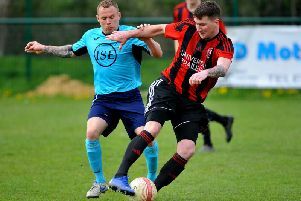 It was the reply, Roffey were asked for after themselves suffering a 5-1 home thumping at the hand of Rottingdean Village in the Division 1 Cup. With a few changes in personnel and tactics, the game started as expected with much of the play congested in the middle of the park. With such a big pitch at the Withdean it was crucial to win the midfield battle to allow the more expansive wingers to be the attacking threat. As the opening exchanges settled down, Roffey began to assert themselves on the game with Grantham working well behind O’Sullivan and linking up play well. The deadlock was broken midway through the first half as good work from the returning Declan Rapley in the middle released Koustavakis out wide, who fired a ball into the box and was met by Grantham who smashed it into the bottom corner. The goal looked like it knocked the stuffing out of a already low-on-confidence home side and it was only a matter of time that the prolific O’Sullivan doubled Roffey’s lead. This was then followed shortly after by a third from Koustavakis for a 3-0 lead at half-time. The second half continued in the same manner with tireless work from James Hancock and David Familton nipping any Brighton advances in the bud. Ten minutes into the second half good work from half-time substitute Tom Pillings, returning from injury, released Koustavakis who slotted his second and Roffey’s fourth to all-but end the game as a contest. With ten minutes remaining, substitutes Allen and Pillings linked up well and the former netted his first goal for the club. Spickett said: “All in all it was a good response to the week before. Brighton Electricity have certainly added some quality to the side but we’re powerless to stop a rampant Roffey on the day.